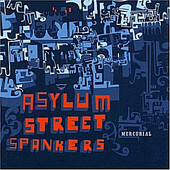 With the longest running, and strongest line-up in the band's history, Asylum Street Spankers' heads Wammo and Christina Marrs decided it was time to do an album to place all the covers that had become live favorites, but were never able to fit on the albums. The two also wanted to add one more twist - record live! The result is a record recorded live to two-track, Mercurial. It includes covers such as "Since I Met You Baby", "Shine On Harvest Moon", "Got My Mojo Workin'", and "Sugar In My Bowl", the group puts an acoustic jazz, jamboree, good-time, country-meets-ragtime spin on old standards, including a medley of TV show theme songs on "TV Party". Fun, funny, and entertaining, Asylum Street Spankers put on one heck of a performance, playing roots music that examines the core of several genres and then has fun with it all, creating a soulful hybrid that will make you smile no matter what kind of mood you're in. I'll give it a B.